Normal, recycling, and programmable recording modes. with detection area alarm and recording triggering modes. Automatically enlarge 1 channel/camera each time. Control the brightness, Contrast, Saturation and Hue. Indicates hard disk space availability. Direct control of the Dome camera to move up, down, left, right, zoom in/out, iris and focus, preset point setting and control, auto-pan and the cruise function. Provide I/O ports control to let user connect with external alarm equipment. Alarm triggered, to send images or snapshots to designated user. Support live monitoring or remote access of video and audio. System supervisor can set authorization in control of the system protection. supports eight video channels with the State-of-the-art software video compression technique. It can a resolution of 640x480l. The built-in voice chips record voice data at the same speed with video recording. These Features: guarantees the quality of recorded images and sound in playback to be "what you see/hear and what you get" performance. Compression Technique SMICT S/W compression rate: 1:40~1:2400 max. 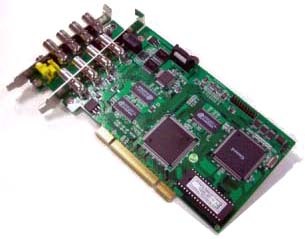 IBP-1308 Video capture card, 8 video channels, 2 audio channels, MJPEG-1 like software compression technique, PCI bus.